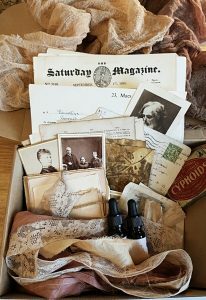 When I sell a handmade journal, I always send it with lots of extras, and over and over I got the same lovely compliment from happy paper fans: “This was better than Christmas!” So, yeah, I am shamelessly going to call these Better Than Christmas Book Arts Boxes. A mini, handmade journal with wraparound cover (each one will vary. The one in the photo is 4/5″ x 3. Click on individual photo for larger view. 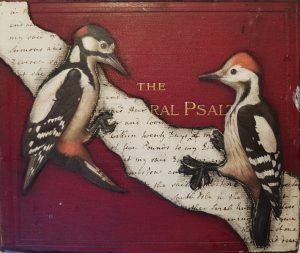 This altered, artist book was created from an early 20th century (English) hymn book. Swiss envelope and stamp, 1902. 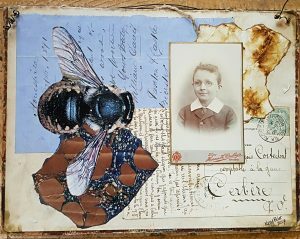 This is a one-of-a-kind work of altered art using a lot of original vintage paper ephemera. It takes many hours to make from preparing the book for embellishing to designing and executing that pages, each one of which is a unique piece of collage. Last year I was hiking in the Blue Ridge Mountains in North Carolina and did a lot of foraging, making my own inks from walnuts and acorns. I also gathered a lot, A LOT of leaves and made eco print papers. 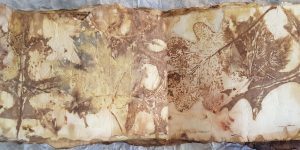 While I usually sell the papers as individual prints, I have wanted to make a book just of leaf prints for a long time. There is just something so mysterious and evocative in these images that each page is a one-of-a-kind piece. 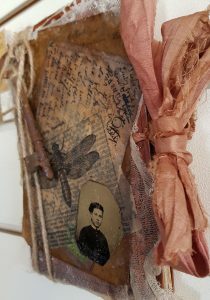 This is an altered book wired for hanging. It can also be displayed on a shelf or table. 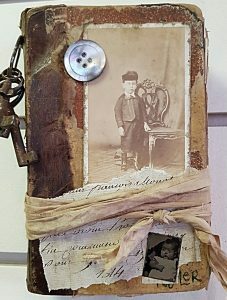 The book is a French book of fables from the 1840s, altered with a carte de visite circa 1880s, gem size tintype of baby circa 1860s, tea-dyed sari silk, and a bunch of vintage keys. 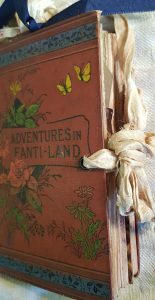 This is an altered book cover for hanging or other home decor. SOLD: This is a vintage book from the early 1910s that has been altered into a blank book/sketchbook/journal. The original pages have been replaced with a variety of tea dyed papers (Daler Rowney – 200 g/m//120 lb., vintage ledger paper, and copies of Redoute flower prints making it sort of junk journal-y. It is approximately 5″ x 7″. While many of the pages are blank for journal work, many have been stained with walnut or other inks for a one-of-a-kind, intentionally messy background to be worked into. It also comes with pockets filled with a variety of tages. The book ties with tea dyed sari silk. This is a vintage book from 1915 that has been altered into a blank book/sketchbook/journal. The original pages have been replaced with tea dyed papers (Daler Rowney – 200 g/m//120 lb.). It is approximately 4.25″ x 6.5″. While many of the pages are blank for journal work, many have been stained with walnut or other inks for a one-of-a-kind, intentionally messy background to be worked into. It also comes with pockets filled with a variety of tages. 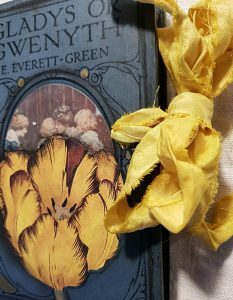 The book ties with tea dyed sari silk. This is a child’s board book that has been altered to include tags, notecards, and mini-notebooks and mini-junk journals. It measures 7 1/4″ x 6 3/4″ (17cm x 16 1.2cm). Please note that this board book does not lie flat when it contains the tags and other ephemera but is meant to be displayed open.